This will be by far the best game out of all the early kickoffs this weekend. The Packers got bullied by the Broncos last weekend, and as good as the Panthers defence is playing, it's not quite as good as what Aaron Rodgers had to face last Sunday. Cam Newton is in the MVP discussion and seems to be having his best year overall since joining the NFL, but he still seems to be turning the ball over a lot too. Clay Matthews will probably be shadowing Newton all game to try & stop him from scrambling, but if he can avoid too many turnovers the Panthers can definitely this game and remain undefeated. Although the Jaguars offence has been pretty productive for the most part this year, and Bortles definitely seems to have matured a lot since last season, I see the Jaguars really struggling against the Jets defence in this one. Regardless of who is starting for the Jets, I see them winning this game. Expect Chris Ivory to have a bounce back game after not being completely healthy for a game or so. If both Marshall & Decker play, I see the Jets running away with it. Just when the Dolphins finally won back to back games and you think they had finally figured it out, you realise they were against two of the worst teams in the NFL. They've finally started leaning on Lamar Miller a bit more which has helped, but I see that Bills pass rush giving Tannehill not time at all. The Bills should be able to move the ball pretty well, providing their quarterback play isn't horrific (hopefully Manuel doesn't play at any point). I pick the Bills to win relatively comfortably. The Raiders are starting to win over a lot of people this year, and deservedly so. Carr is really starting to look like the real deal at quarterback, Amari Cooper is absolutely ridiculous, Khalil Mack is a monster, they're finally starting to put a good team together. Anyway, this game should be a close one, but seeing as Roethlisberger had an absolute shocker against the Bengals last week, I see him having a monster game this Sunday. Expect Antonio Brown to get 5+ catches and have a huge game, and although they've lost Bell for the season, Deangelo Williams is more than capable of getting the job done at running back. I've got the Steelers winning, just. How the Minnesota Vikings are 5-2 on the season I honestly have no idea. I really like their defence, and the Rams offence hasn't exactly put up a lot of points this year either. I can't see the Rams getting to 20 points, which in my opinion is all it may take to get the win in this one. Teddy Bridgewater may struggle in this one, but I see the Vikings getting the win in a pretty low scoring game. The Titans actually have a top 10 defence surprisingly enough, but I can't see them slowing down Drew Brees. Although it was against the Giants defence, he finally looks comfortable again since losing Jimmy Graham. The Saints would put up madden-like scoring again this weekend, and it'll be interesting to see how the Titans play after their coach got fired, and with Mariota coming back from injury. I see the Saints winning by a touchdown or more though. The Redskins have played a lot of teams closer than they should have so far this season, but against the Patriots in Foxboro, not gonna happen. I can see Brady having another big game, as he slowly pulls away from Rodgers & Newton in the MVP voting. Cousins may be able to move the ball effectively against the Patriots defence, and will need to put long drives together to keep Brady off the field as much as possible to have a chance. Patriots should win big though. Kaepernick finally got benched, but Blaine Gabbert isn't exactly the answer for the Niners. Their running back situation is a mess at the moment as well, as no-one can stay healthy. On the other side of the ball, Matt Ryan seems to be off his game lately, but Julio Jones definitely isn't. He's on pace for over 1500 yards, and well over 100 catches. If he sticks to his season average or better today he'll pass 1000 yards on the season, and it's only week 9. Devonta Freeman should have another big game in this one, I see Atlanta winning comfortably. Winston finally seems to have stopped giving the ball away so much, and against the Giants defence he should have a solid game. The Bucs have some really good players at some positions, but they just don't seem to have put it together yet. Will be interesting to see how much of a different the 7 fingered Jason Pierre-Paul makes on his return for the Giants. I see the Giants winning but it should be pretty tight. No-one in the NFL wants to play against the Broncos defence at the moment, let alone the interception machine that is currently Andrew Luck. Luck always seems to play his best in games the Colts really shouldn't win, and this is one of them. This game will either shock everyone and be extremely close, or the Broncos will win heavily. Always interesting to see Manning going back to the stadium he played in for so long though. As an Eagles fan, this is always the biggest game of the season. Prime-time, rivalry game, Demarco Murray vs his old team, and Greg Hardy against everyone by the way he's been acting on the sidelines lately. This should be a relatively low scoring game, as the Cowboys defence has actually been very good this year, and Bradford can't stop turning the ball over. Matt Cassel will also struggle in this one, so Dallas should lean on the run game, but that is also the strength of the Eagles defence. I'm picking the Eagles to win, mainly because Dallas just aren't the same team without Tony Romo, and because I think the Eagles can shut down the Dallas run game. Two teams that are absolutely all over the place at the moment. It will be interesting to see how the Bears move the ball without Matt Forte, as he accounts for so much of their offence. Langford, who is filling in for Forte, should have a big game against that Chargers run defence though. 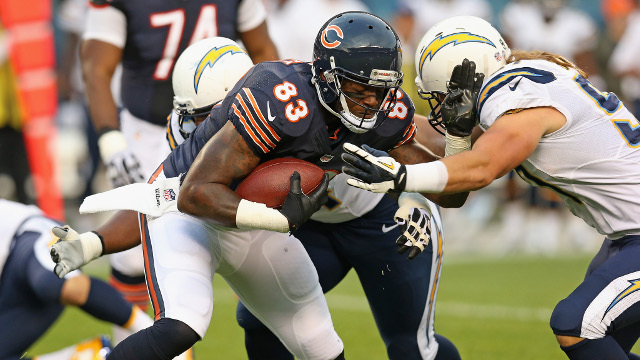 Rivers will need to have another big game, as the Bears are stopping the run surprisingly well this year. I'm picking the Chargers to win, but this has a chance to turn into a shootout. There isn't a whole lot of value this week, so i've picked a couple of what I consider to be the safest winners to put an accumulator together.